Deviled eggs are one of the most recognizable dishes at any event! A tray of deviled eggs is sure to be a party pleaser and are often the first treat consumed. With their yummy yolky texture mixed with mayonnaise and mustard, they can satisfy cravings for something savory. Unfortunately, the traditional (and delicious) recipes are loaded with calories and fat. Eating one is not the issue, but often, these eggs are hard to stop at just one! One traditional deviled egg is just under 200 calories! 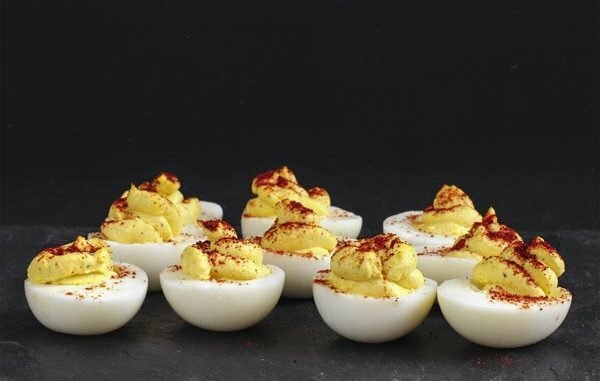 Fear not, because Rocco Dispirito, in Rocco’s Healthy + Delicious cookbook, brings us a more angelic way to make deviled eggs, reducing the calorie content down to just under 100 per serving without reducing the deliciousness! Traditional deviled eggs are made with mayonnaise and yellow mustard; mayonnaise is very high in calories. This recipe substitutes mayonnaise with So Delicious’ unsweetened non-dairy coconut yogurt (found at your local Target, Walmart, or Whole Foods Market). This recipe also completely skips the mustard! Prepare a bowl that will fit the four eggs, filling it with ice and water. In a small pot, put the four eggs inside and fill the pot with cold water, enough to cover the eggs. Make sure to use cold water as the slow progression from cold to boiling keeps the egg shells from cracking and it also promotes more even cooking. Once the water boils, set a timer for 8 minutes. Once the 8 minutes are up, drain the water in a strainer and move the eggs to the bowl with the ice and water. Peel the shell when the eggs cool off. Cut the eggs in half, the long way, and scoop the yolk into a small bowl. Set the whites aside. In the small bowl of yolk, add the ½ teaspoon of smoked paprika, 1 tablespoon of chopped Italian flat parsley, 1 teaspoon of lemon juice, 2 tablespoon of coconut yogurt, and cayenne pepper to taste. Mix the yolk with these ingredients. With a spoon, scoop the newly mixed yolk into the egg whites. Sprinkle some smoked paprika on top for garnish. Swapping out mayonnaise for coconut yogurt brings many benefits including a reduction in calories and an increase in vitamins from the yogurt. The yogurt helps build bone via the calcium content and also contains vitamin D, which helps your body absorb the calcium. There is also magnesium for better muscle function and B12 for mood boosts. This dish is not only very simple, but it is cheap and quick to make! Even though these deviled eggs are a healthier version, be sure to keep moderation and mindful eating in mind. These eggs will sure be a crowd favorite during your next gathering!